Today, we see that cow milk is consumed across all age groups worldwide since it offers benefits in growth and development. India is one of the largest milk producing countries in the world, with a production of around 127 million tonnes (2011-12). The nutritional benefits of cow milk as part of an overall balanced diet are well established. Recognizing this, we at Nutricia use high quality cow milk as a key ingredient in our products adapting it to suit the requirements of target consumers. When can cow milk be given to infants? When it comes to feeding infants, breast milk is the gold standard and offers the ideal nourishment for their growth and development. Renowned associations like AAP (American Academy of Pediatrics) and ESPGHAN (European Society of Pediatric Gastroenterology, Hepatology and Nutrition) recommend that infants should not be fed cow’s milk before12 months of age. 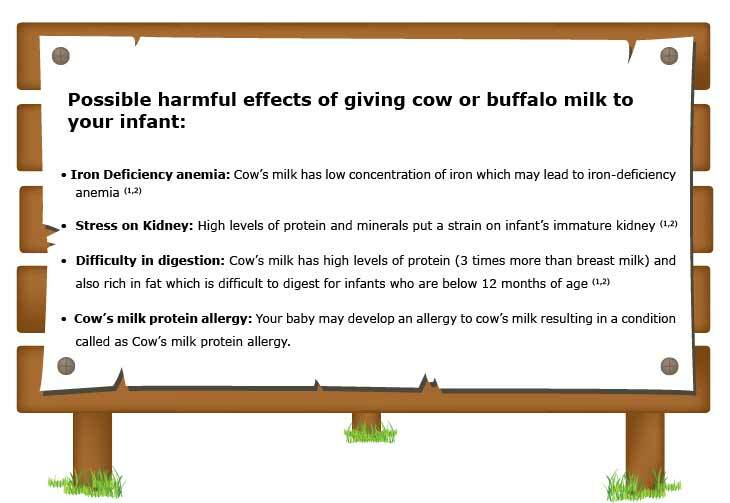 Why is commonly available cow or buffalo milk (fresh or prepacked) not suitable for your infant under 1 year of age? References: 1. Tiwari S. Infant and Young Child Feeding Guidelines: 2010.2010;47:995-1004. 2. Breastfeeding and the use of human milk. Paediatrics. 2012;129(3):e827-e841. Unable to breast feed, cows milk is NOT THE NEXT option! Talk to your pediatrician.